In June 2016, the Ethereum community was split in a hard fork as a result of the Decentralized Autonomous Organization (DAO) attack. Ethereum Classic (ETC) is the less known sibling of ETH, and the original chain who on the principle of preserving blockchain’s immutability refused to refund any stolen funds. Following the 6 Aug. listing of ETC on Robinhood, crypto exchanges like Coinbase and Bittrex also announced the support of ETC fiat-trading pairs this week. 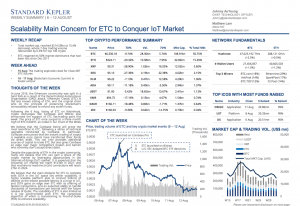 The price of ETC once surged to a three month high of BTC 0.00297, as noted in our Chart of the Week. We believe that the Coinbase listing will prove the most beneficial to ETC, following a series of technical upgrades conducted by Coinbase. In particular, Coinbase announced that the instant trading of crypto is available once clients have transferred their funds via direct debit. This not only provides additional sources of capital to trade ETC, but also gives Coinbase an edge over major competitors Kraken and Gemini who currently don’t accept direct debit. Despite the popularity of ETH in the crypto community, many still believe that ETC can gain a share of the crypto market by leveraging opportunities in the Internet-of-things (IoT) market. It is expected that the industrial IoT market will reach $123bn in 2021, and that machine-to-machine (m2m) connections will reach 27bn in 2024. We believe that the main obstacle for ETC to compete with IOTA in the IoT space lies within scalability. A highly scalable platform able to connect billions of devices at the lowest possible latency is a must in IoT, and IOTA gains an edge over ETC with its offering of feeless transactions, and an expected ability to handle thousands of transactions per second with the future release of Qubic. The scalability of ETC is also limited as it is not synchronized with ETH, the consensus algorithm of which is transitioning to Proof-of-Stake (PoS) to enhance scalability.